Photograph from Friday Harbor Canning Co. 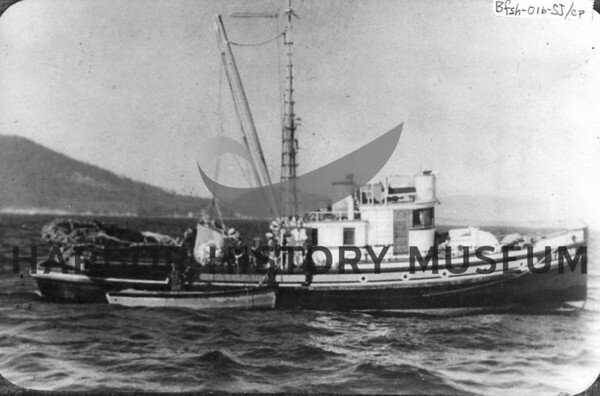 The "Avalon" in July 1941 or before - after sockeye in Rosario Straits, San Juan Islands. James Island seen in background. Antone Skansie, age 25 at handle of brailer. Photo taken by cannery tender. It was a good catch. Tony Sunich in skiff; it was built for Andrew Skansie. Tony Bussanich, cook, appears in white hat. Roller in stern motivated by engine mounted on turntable. When the Puratich block was invented, it replaced the wood rollers; driven by rope to keep it cheap - 1800 ft. rope. Use of it began in California but it wasn't successful. When it was available out of Seattle, locals bought it, powered the winches with rope drive off the engine.